As a business owner, you should know by now that the internet can make or break you in this modern economy. If you don’t have a website, many customers, especially younger generations, will likely choose your competitors who do. If you have a strong web presence, you will notice a large increase in revenue and sales, as well as an increase in return customers. This is especially true for the restaurant industry, which is highly competitive. Thankfully, sites like Mojo Themes are making it easier to find quality WordPress restaurant themes to help you get your foot in the door. 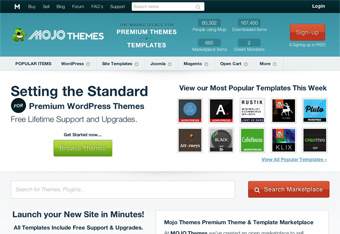 Mojo Themes or MojoThemes is a WordPress theme marketplace where developers can sell their products, which range from simple Photoshop templates to intricate premium WordPress themes and templates. They also sell themes and templates to fit a variety of different CMS’ or content management systems. If you are trying to build a website for your restaurant, you can choose from Joomla restaurant templates, WordPress restaurant themes, or simplified HTML restaurant templates. What sets Mojo Themes apart from the competition is variety. Most businesses that sell WordPress themes only use a handful of designers and developers, making the selection somewhat limited. But at Mojo Themes, you can choose from hundreds of different designers and developers, each with their own style and expertise. Mojo Themes boasts some truly impressive numbers. There are currently 1,020 different marketplace items and more than 73,000 people using the Mojo Themes marketplace! Perhaps even more impressive, as of the time of this writing there have been more than 194,000 items downloaded via Mojo Themes! With so many options to chose from and so many satisfied customers, it’s no wonder Mojo Themes has been so successful!